How Long Do Leftovers Last? How long do leftovers last? Leftovers last as long as the fastest expiring ingredient in the recipe. Generally speaking, leftovers made from fresh ingredients last for 5-7 days in the refrigerator - but please consider all information contained within our pages to make informed decisions. The shelf life of leftovers depends mainly on the ingredients within, the preparation method and how the leftovers are stored. Leftovers come in all shapes and sizes and never carry a best by date so let's take a closer look at leftovers. Leftovers, if they haven't been sitting out too long before refrigeration or freezing, should last for the time periods listed below. Please be sure to always follow all safety precautions when handling leftovers. Of course, all foods last for a shorter period of time if they are not stored properly. Since there is never a best before date to use as a guideline for how long leftovers last you need to rely on your senses and memory of when you actually cooked or ordered the original dinner. As you can see from the table above, because of the many variables involved with how long leftovers last, including long lists of varying leftover ingredients, it's hard to determine exactly how long leftovers last. An excellent practice is to clean out your fridge every week just before your trash day and throw out any leftovers that were there last time you cleaned. There are very few leftover dishes that can withstand longer than 7 days in the fridge. When bringing home restaurant food that you will not be able to consume the next day, be sure to re-wrap it in airtight containers when you arrive home. 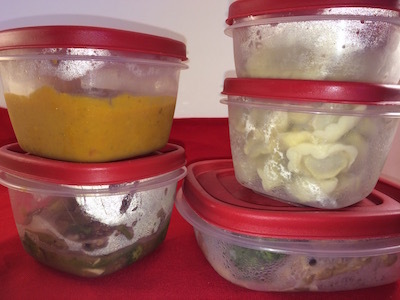 Take out containers are generally not air tight and your leftovers will deteriorate far more quickly if stored in them. How to tell if Leftovers are bad, rotten or spoiled? Use leftovers promptly for best results and to avoid the growth of any bacteria which may have contaminated your leftovers during service. As with any other food, rely on your senses and discard any leftovers that have changed in odor, coloration, or texture from when you first placed them into the refrigerator. And, always discard leftovers with any tell tale signs of mold. For more information on the food safety of leftovers, be sure to visit the FDA website. How to store Leftovers to extend their shelf life? You can help leftovers stay fresh longer by storing them in air-tight containers in the refrigerator as promptly as possible (*but never longer than 2 hours*) after each meal. During the hot summer months, especially after a picnic, you will want to return your leftovers to the fridge after only an hour. Also be sure to maintain your refrigerator to never allow the temperature to rise above 40°F. For a long term option, quiche can be frozen. Leftovers is an extremely wide open category, most anything can be considered a leftover. Some people love them and think that many dishes have even more flavor the next day when re-heated, and others just want to throw out whatever is left from a meal. We, of course, do not want to waste anything so are of the first category and think that leftovers are fantastic! Either re-heated or turned often into a brand new dish, we never throw leftovers away until they reach their eat by date. But, as we've stated on most every page, recipes only last as long as the quickest expiring ingredient in the dish. This is particularly true if you are using an ingredient such as mayonnaise, which spoils rather quickly when not refrigerated, and have left the dish sitting on the table too long before refrigerating. Remember that a leftover needing refrigeration should always be placed into the refrigerator before the two hour time limit expires (this invites bacteria to grow). How to use extra before your Leftovers go bad? For ideas on ways to use Thanksgiving leftovers for breakfast, see our post on leftover breakfast ideas. To find out how long Thanksgiving leftovers last see our handy Christmas leftover image, since many items are popular at both holiday meals. How long are Leftovers good for when prepared in a dish? How long do leftovers last? That depends. 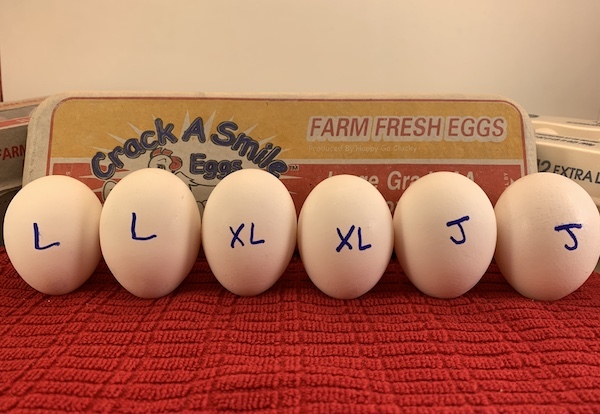 How long do eggs last? In general, leftovers last only as long as the quickest expiring ingredient in the recipe. In determining how long Leftovers lasts, our content incorporates research from multiple resources, including the United States Department of Agriculture and the United States Food & Drug Administration. In addition, we scoured the web for informative articles and reports related to food safety, food storage and the shelf life of Leftovers. Although the Leftovers shelf life information on Eat By Date is generally reliable, please remember that individual cases will vary and that our advice should only be taken as an opinion and not a replacement for your health care professional. Please eat responsibly!